They hung with No. 23 Arizona all the way to the end in front of a raucous 9,266 Saturday, but the Washington Huskies came up short against the senior-laden Wildcats, 77-72 (box). Arizona’s Ryan Anderson rampaged his way to a double-double with 22 points and 15 rebounds, eight on the offensive end. Leading 75-72 with 0:31 to play, the Wildcats’ Gabe York brought the ball to the baseline and put up a long jumper, which hit the iron and fell into the paint. Despite being surrounded by four Huskies, Anderson secured the rebound, drawing a shooting foul from Marquese Chriss. Anderson sank both free throws. Andrew Andrews recovered from a quiet first half (six points, 1-of-4 from the field) to finish with 20 points. Chriss played 35 minutes, scoring 18 and grabbing seven rebounds before he fouled out in the final minute. Matisse Thybulle had a career high six steals and 11 points along with three blocks in 34 minutes. 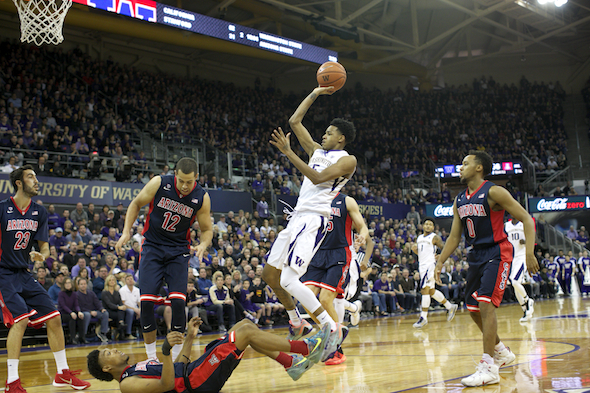 As a team, the Huskies finished with 10 blocks and 13 steals, forcing 20 turnovers from Arizona. Dejounte Murray and Malik Dime scored 11 and 10, respectively. Anderson’s 22 was built on the back of a 10-of-11 performance from the charity stripe. Gabe York finished with 18 points, going 7-of-21 from the field. The Wildcats out-rebounded the Huskies 43-29, including a 17-8 on offense. Arizona scored 21 second-chance points against Washington’s 6. “I don’t think we let (the fans) down. We delivered; we played a completely different game than the first time . . . only thing was keeping them off the glass. But we had 20 turnovers, we had 13 steals.” – Senior guard Andrew Andrews on the frustration of losing a close game in front of the season’s largest crowd. The Huskies travel to Salt Lake City to play Utah (17-6, 6-4 Pac-12) Wednesday at 6 p.m. PT. The Huskies lost in overtime to the Utes, 80-75, in the home game Jan. 24.